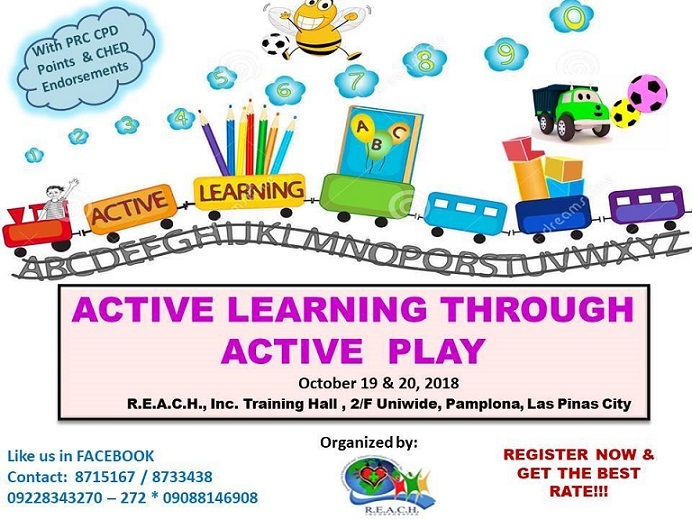 Overview: This workshop will focus on learning the basics of physical development in the early years and what research tells us about the benefits of creating effective movement programs for the preschool and early primary classrooms. Participants will engage in mapping long-term goals and writing age-appropriate lesson plans. The workshop is designed for classroom teachers, particularly teachers in schools lacking large movement spaces, movement specialists, curriculum directors, and administrators. Participants do not need to be sports enthusiasts to take advantage of this playful and highly engaging workshop! Create developmentally appropriate lesson plans based on current research. 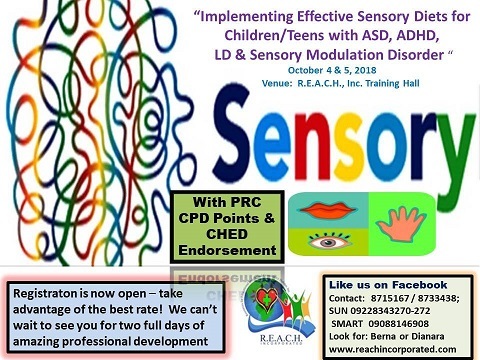 Venue: R.E.A.C.H., Inc. Training Hall, 2nd Flr., Uniwide Sales Metro Mall, Alabang-Zapote, Las Piñas City. Overview: Sensory Processing Disorder (SPD) impacts a person’s ability to translate signals from the senses properly. One important component of sensory processing is sensory modulation, which is the ability to respond appropriately to incoming sensory information. While this can be a stand-alone disorder in some individuals, we commonly see modulation issues overlap with ASD, ADHD, LD, and SPD. The use of a sensory diet is a research-based method of providing these individuals with the sensory input they need to function their best. This practical and evidence-based seminar will equip therapists (beginning to intermediate level), teachers, and caregivers with the ability to determine the sensory needs of the child and implement a sensory diet to meet the child’s needs effectively. Identify the three types of sensory modulation disorders. Utilize provided forms and checklists to empower parents and teachers to support the children in their daily environments.